Councillors told the BBC they were "disappointed" the deadline was missed. They said they would push for a report on buffer zones to be taken forward as promised. The council had unanimously backed the motion which asked Glasgow's Integrated Joint Board to explore how the anti-protest zones could be implemented. It comes as anti-abortion activists are protesting outside hospitals around Scotland as part of what they call a "peaceful prayer initiative". 40 Days for Life vigils are taking place in Glasgow, Falkirk, Aberdeen and Dundee. The movement was founded in Texas in 2004 and its members stand outside hospitals and clinics where procedures take place, and pray for 12 hours a day over the Christian period of Lent. Last year an order came into force to stop both anti-abortion and pro-choice campaigners from standing within 100m of a clinic in Ealing, west London. More recently, a Public Space Protection Order (PSPO) also came into effect outside a clinic in Richmond. However, the legislation used in England to implement buffer zones around reproductive health facilities is not the same as in Scotland. Due to this, councillors unanimously called on Glasgow City Council to liaise with the Integrated Joint Health Board (IJB), Police Scotland and the Scottish government to assess the "legal instruments" needed to implement such buffer zones. A spokeswoman for the chief officer of IJB said discussions were taking place on proposals. Despite missing the deadline by three months, she said: "A paper is being prepared for a future committee with recommendations on how we can work together to progress plans." Why did Glasgow back a buffer zone? Councillors said the right to peaceful protest should not interfere with the fundamental right of women to make individual reproductive choices, or NHS professionals to do their job without fear or abuse. It applauded the actions of Ealing Council and said it supported the principle of buffer zones. SNP councillor Elaine McSporran, who first proposed the Glasgow motion, told the BBC: "There is no intention to stop people having their right to protest. "It is, however, about allowing people to access these facilities without fear or prejudice regardless of what they are attending for." Councillor Kim Long, from the Scottish Greens, said: "There are any number of places to hold a protest in this city, but it's not appropriate for people to have to walk through a gauntlet before they can access healthcare. "Demonstrations outside hospitals - even silent prayer vigils - are intimidating and inappropriate, and anyone who claims not to understand the harm they cause needs a better understanding of gender inequality." Scottish Labour councillor Eva Murray said her colleagues had a "duty of care" to implement the buffer zones to protect constituents. Why are the protesters there? 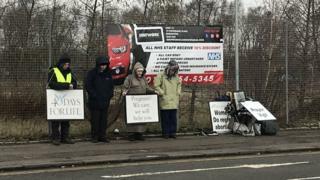 Rose Docherty, campaign director of '40 Days' in Glasgow, spoke to the BBC about why she and her group stand outside of the maternity unit at Queen Elizabeth University Hospital. She said: "We are all praying for a culture of life in Scotland. "We pray on the streets as a visible witness to the fact that we have a strong culture of death in Scotland, and also to be an offer of hope and help to those considering abortion." She said they were "not insensitive to people's feelings". "I'm sorry if people are feeling upset but we know it is not our intention to do so," she said. "We have taken as much care as possible to alleviate any feelings of stress," Ms Docherty said. "Someone has to defend these children." What is happening elsewhere in Scotland? In Falkirk, Megan Porter, a businesswoman and mother, decided to set up a petition to implement a buffer zone after she found '40 Days' praying outside Forth Valley Royal Hospital. "People should be able to access legal healthcare without harassment. You should support choice. "Them standing there isn't just solely affecting people going in for abortions," Megan added. "It's affecting people who have just had a miscarriage, who are going for their scans, or who have just had a baby. The 40 Days protests have not been taking place in Edinburgh this year but a motion to set up buffer zones was considered this week after concerns about regular vigils outside the Chalmers Centre. A spokeswoman for Edinburgh City Council said: "These were discussed by the South East Locality Committee on Monday and it was agreed that the situation would be monitored and feedback would be collected as we consider next steps."